It’s very nearly 12 months since I last posted. A year in which I’ve done a lot, learned a lot, and (best of all) learned something of how much more there is for me to learn. I feel as though I’ve been gathering pretty pebbles as I walk along the edge of the sea. Now I have a double handful of beautiful stones and it’s time to start setting them into patterns to see what they mean to me, and might mean to others. Over the last month or two I’ve found I really miss the chance to write, or rather, I now desire the discipline of setting my thoughts in order to consider and communicate ideas. I started this blog to document a journey into weaving, which rapidly became a rediscovery of knitting, and then an exploration of spinning. I blame Ravelry, where as sarahw I’ve met an incredible number of inspiring and helpful people and I think I’ve done my share of enabling and aspinnerating, too. I’ve accomplished quite a lot of spinning (I confess I want to show off some of the results! ), which, together with discussions with Abby Franquemont and many others led me to think about the origins of this craft. It’s more ancient than you might think; after all, how long have we been wearing clothes? And now I wonder how the lives of my female ancestors changed as society changed, as technology changed. I have done some reading, I will be doing more, and I will try to record my discoveries and thoughts here. not only handspun, but hand-dyed. Yes, my name is Sarah and I already have a problem. Despite wearing only sludge colours, I cannot resist playing with REAL colour. This entire spinning lark started because I wanted to spin barberpole sock yarn, and look where that’s got me. A box full of Russell Dyes (I love the colours), a bag of Jacquard dyes arrived last week. I have indigo, weld, madder. 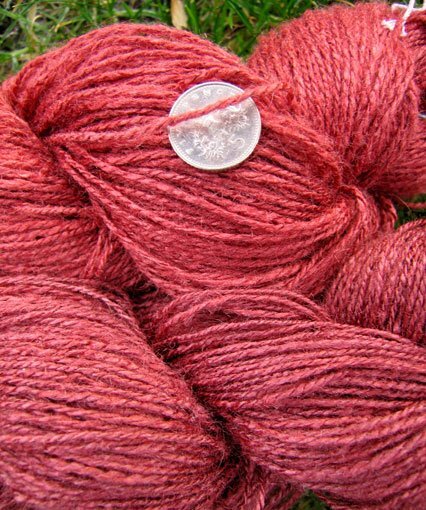 Over the summer I collected urine and managed to persuade a traditional sig vat to dye some merino blue; I’ll tell you about that too, sometime. Or if we have a proper summer this year I’ll do another one! That’s roughly 450m, which is destined to become a Swallowtail Shawl for the local spinning group challenge. Which is my fault: my lace-knitting proved contagious! This is a curiosity, a Christmas gift spun for a friend It’s 50% undercoat from her semi-longhair cat, 30% merino and 20% silk. A cabled 4-ply, my first serious exercise in yarn engineering. Cat is soft but completely lacks elasticity (hence the merino) and is completely dull (hence the silk). Cabled 4-ply to reduce shedding of shorter hairs. This entry was posted in Uncategorized on January 12, 2009 by sarahw. Sarah, you may not believe this but I was thinking about you yesterday. Thinking about where you’d gone and what your were up to; thinking about how much I missed your writing and, well, you.And here you are, with amazing tales and spinning cabled yarn. Terrific! I must confess to have been kept in touch with some of your awesome lace knitting & spinning via Ravelry, but it was lovely to see your blog 'light up' via Bloglines. Ravelry, I guess, has led to lots of people blogging less, me included but nevertheless it has enriched the lives of knitters in so many other ways.I still have my 'Suri' lace weight waiting for the right project, maybe this year I will decide that my skill level is worthy of it! Happy New Year! The Tour de Mont Blanc was my backpacking highlight -worth a thought! YAY! A blog post. I’ve always loved your blog posts, even before I met you. Ravelry is awesome, yes, but it’s not a *blog*. Hi Sarah,I too have been wondering how you were doing. It’s so nice to see a new post from you! Please share more of your adventures. 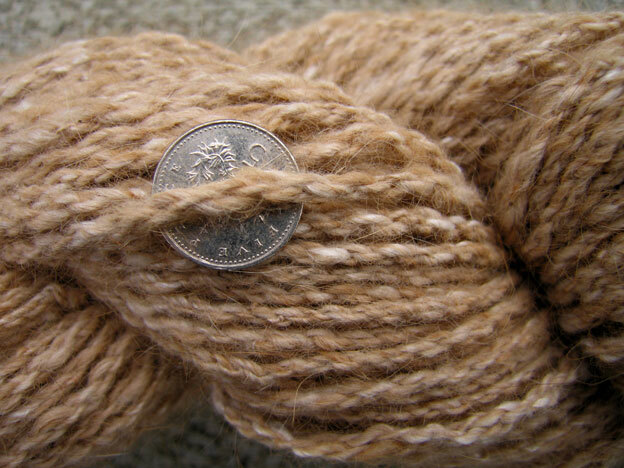 well Happy New Year and lovely handspun stuff to you! You’re back! Thanks so much for the lovely comment on my blog. I’m thrilled to see you posting again…I too am on Ravelry but just cannot keep up with it all the time. Your blog, however, is worth the wait. 🙂 Sorry it took me so long to discover you were posting again!